The most significant company in the video and computer game space is one that people do not frequently think of Tencent, which has a market value of $229 billion (more than the market value of Apple, Google, Microsoft, Sony and EA combined). Tencent’s game properties include the biggest PC game (League of Legends), the strongest mobile franchise (Clash, as in Clash of Clans and Clash Royale) and the most important console game company (Epic, maker of Unreal and Gears of War). Tencent is also a very progressive company, allowing is investments the autonomy to make decisions and grow. I was doing some research last week, when I was surprised at a company with a $200+ billion market value (market capitalization). The company was Tencent, with a market cap $229 billion. For comparison Microsoft has a market value is $479 billion. Apple is at $614 billion. It is definitely more than Sony, who only has a $37 billion market. Want to try EA, forget it, only $24 billion. Clash of Clans and Clash Royale from Supercell. Tencent acquired Supercell this Spring. Unreal and Gears of War developer Epic Games. Tencent is the largest shareholder in Epic, probably the most important developer in the console game space. Unreal is the engine (a suite of game development tools) used to create many of the most popular games in the world, from Dragon Quest and Final Fantasy to Moto Racer to Street Fighter to Assassins Creed to Brothers in Arms to…. Not only is it the most successful game development engine, Epic’s first party titles include Unreal (big surprise), Gears of War and Infinity Blade. League of Legends creator Riot Games. Tencent controls the largest PC game in the world, League of Legends. 8 Ball Pool and Agar.io developer Miniclip is another Tencent company. Miniclip always sems to have multiple games in the top-10 mobile charts and has tens of millions of daily players. Kim Kardashian Hollywood developer Glu Mobile. Tencent is a minority investor in the most prolific mobile developer that uses big name IP, such as Kim Kardashian, Nicki Minaj and Gordon Ramsey. QuizUp from Plain Vanilla is another part of the Tencent empire, as Tencent is one of Plain Vanilla’s largest investors. Skylanders, World of Warcraft, Destiny and Call of Duty owner Activision/Blizzard is also part of the Tencent empire. Tencent owns 25 percent of Activision/Blizzard. And there is more. Tencent is also one of the largest shareholders in PocketGems, Dots, Robot Entertainment and I am sure some I have missed. When you look at the properties that Tencent controls (Clash of Clans, League of Legends, etc), it is clearly the most important company in our space. In my conversations with people at some of the companies above (and this data is totally anecdotal), Tencent is a very interesting parent. People often group it with Japanese and Korean companies, which are often very challenging to work at. My friends who have worked for Japanese companies complain about how western employees and executives had virtually no autonomy to make decisions (they were all made at the Japan level) and even then decision making was excruciatingly slow. From what I have heard, Tencent, and Chinese companies in general, are pretty much the opposite and often more progressive than western companies. Tencent has left the companies above very autonomous and business has barely changed on the day-to-day level. Tencent, however, has helped these companies grow by expanding into the Asia. Most surprisingly, in the incredibly cynical game space, I have not heard anyone say anything bad about working for Tencent. Chinese multinationals are often much more progressive than other Asian and often western competitors. In 2013, I wrote about how Haier (a Chinese white goods manufacturer) eliminated all of its middle management, a concept here that companies (other than Zappos) are just starting to look at. I have never worked at a Chinese company and have actually interacted very little with them, but between Tencent, Haier and Alibaba (the world’s most successful retailer), Chinese companies show many progressives traits that lead to success in the game industry. When you combine Tencent’s market valuation with its network of the most important game properties, it is clear that they are the most important game company in the world. Over time, Tencent’s performance will be more parallel to that of the game. When Tencent does well, the game industry does well. When the game industry does well, Tencent will do well. Activision’s earnings announcement yesterday shows how attractive successfully conquering the physical virtual goods market is. On November 27, I blogged that Activision would be the big winner Q4 2012 on the strength of the Skylanders franchise and its reliance on a new business model, selling physical versions of virtual goods. I elaborated on that post earlier this month, commenting that the emergence of the Physical Virtual Goods monetization model was one of the most exciting developments in the gaming space in years . Today, Activision’s stock rose 14 percent because earnings tripled from the fourth quarter last year (in a period in which overall video games sales slumped). Net income increased 257.58 percent to $354 million in the quarter versus a net gain of $99 million in the year-earlier quarter. Revenue rose 25.66 percent to $1.77 billion from the year-earlier quarter (unfortunately, some of that is due to my family). This report affirms my belief that physical virtual goods are an incredible opportunity. While I do not advocate trying to copy exactly what Activision has done (I believe in blue oceans, not fast following), there are many elements in this space (e.g., product type, demographic) that represent incredible opportunities for game companies. 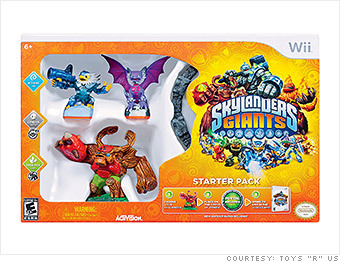 As an update to my post yesterday on Physical Virtual Goods as exemplified by Skylanders, Activision just announced that Skylanders generated over $500 million in retail sales in the US and generated more revenue than the holiday box office for kids’ films. The use of virtual goods in a physical form is one of the most interesting (and profitable) monetization techniques that I have seen. By “physical virtual goods” (my term), I mean taking a virtual good that is normally sold through an in-app purchase and making it into a physical retail item that is used to unlock the virtual good inside the game (with no functionality for the physical product). Although this is by no means a prediction based on any scientific data, I am already seeing big trends this holiday gift season that will impact game companies significantly. By talking to my children and their friends, visiting major retailers and getting virtually every online retailers newsletter, it is becoming clear there will be some big winners and losers this holiday season that also show how the industry will continue to evolve.